Does a scenic ferry ride get your brain waves going? Now is the time to take a sail on one of our vessels with a pen, paper, and a poetic mind. Get inspired for our ferry haiku cover contest on Twitter! We’re looking for a traditional haiku about the Washington State Ferries experience. The winning poem will be featured on the cover of our Summer 2018 Sailing Schedule! 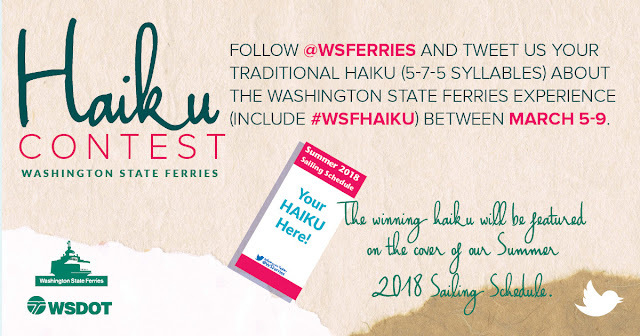 All you have to do is follow @wsferries on Twitter, then tweet your haiku between noon Monday, March 5, and noon Friday, March 9, 2018. Be sure to include the hashtag #WSFHaiku. All members of the public, except WSDOT employees and contractors, are eligible and invited to participate. No fare purchase is required. Poem must be a traditional haiku with five (5) syllables on the first line, seven (7) on the second and five (5) on the third. Haiku must be about the Washington State Ferries experience. Poem must be the sole, original work of the entrant. An entry may be disqualified if it has been previously published or won awards or competitions. Each contestant may submit up to three haikus. Any additional haikus received after the first three are not eligible. By entering, all submitters grant us the right to use their poems for marketing and communication purposes. Do not send your haiku via direct message on Twitter. A panel of judges will select up to 25 entries based on relevance to the WSF experience. Those submissions will be sent to Washington State Poet Laureate Claudia Castro Luna, who will choose three finalists based on creativity, originality, content and writing. Decisions of the judges are subjective, final, and cannot be appealed. The finalists’ poems will be posted on the @wsferries Twitter page at noon Monday, March 19. The haiku with the most likes at noon Friday, March 23, will be named the winner. We will then work with the winner to find a photo to serve as a background for their haiku. The work of art will be featured on our 2018 summer schedules! A typical day for maintenance technician Don Maybury includes keeping our rest areas and maintenance buildings in northern Whatcom County running. And like most of our maintenance staff, he’s trained to use our snow and ice equipment to help out when winter weather hits. But Friday, Dec. 29, 2017 was anything but a typical day for Don. In fact, he wasn’t even supposed to be at work. But instead of a Friday night with family, Don found himself stuck in a snowplow for about five hours on SR 539/Guide Meridian north of Lynden when freezing rain brought down almost a dozen power poles. How did he find himself in this predicament? It didn’t take maintenance supervisor Bill Joyce long to see that the weather forecast meant he’d need some extra staff. With up to a half-inch of freezing rain predicted, he knew that it was going to lead to some really icy and hazardous conditions. One of his calls was to Don, who arrived at about 3 p.m. to prepare himself and his plow for what would surely be an interesting shift. 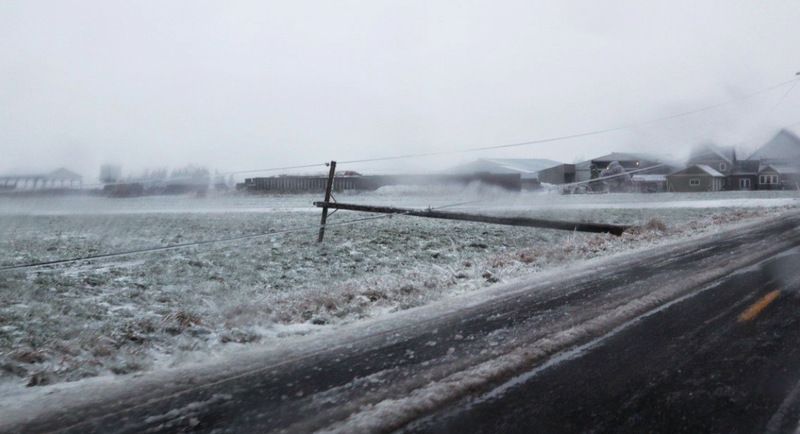 Before his team headed out, Bill reminded them to be careful and to be aware that an ice storm like this could start bringing branches, power lines and other hazards down. As it turns out, he was right. After working north through Whatcom County, Don slowly made his way up The Guide, past Badger Road (SR 546), where he found a downed power pole blocking the highway north of Lynden. As he waited for traffic to clear, he began to maneuver the plow to turn around. The ice and pressure from the other fallen poles was too much and another came toppling down – leaving lines tangled up all over Don’s plow. Don alerted his supervisors to the situation and Bill headed to the scene. The highway was covered with ice chunks the size of cobblestones. When the lines came down, they hit frozen ditches and sent icy chunks of water splashing all over the road. Assuming the lines were still live, Bill told Don to stay put. With utility crews racing all over the county responding to situations, it became a waiting game for Don and Bill. The State Patrol and fire crews checked in to make sure Don was OK and he was, staying calmer than most would in a similar situation. 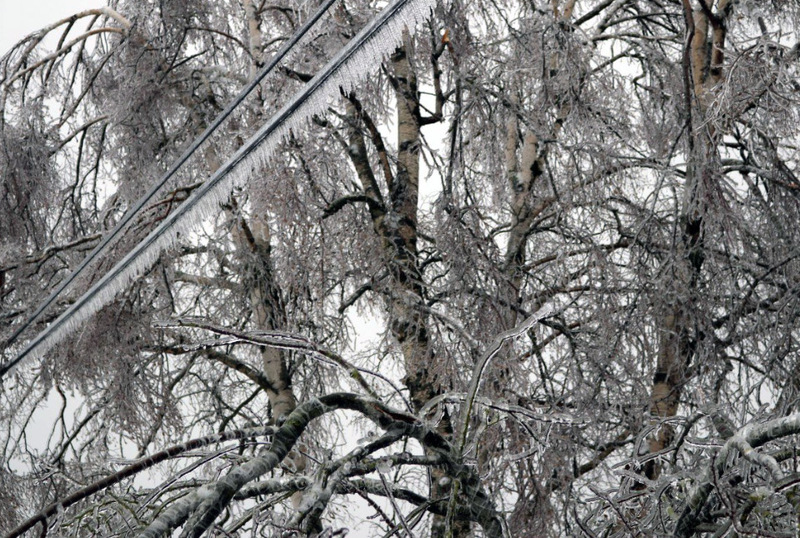 Once the utility crews made it to Don, they found they had to actually chip inches of ice off the wires before pliers would even fit around them. They then had to cut lengths of the wire smaller than usual to be able to lift them off the plow and the road. Five hours after that pole and lines crashed down, the lines were cleared and the area deemed safe. Bill and Don backed the plow off the road so it could head back to work, clearing roads for the public. Energized lines can charge the ground near the point of contact and may electrocute you. If a person or pet comes into contact with a downed power line, remain clear. Do not touch them or the wire. Our crews are well trained on how to handle these situations, and you can be sure they’ll use this incident to reiterate just how important it is to follow these tips. It’s a great idea for you to also remember them, and share them with your friends and family. 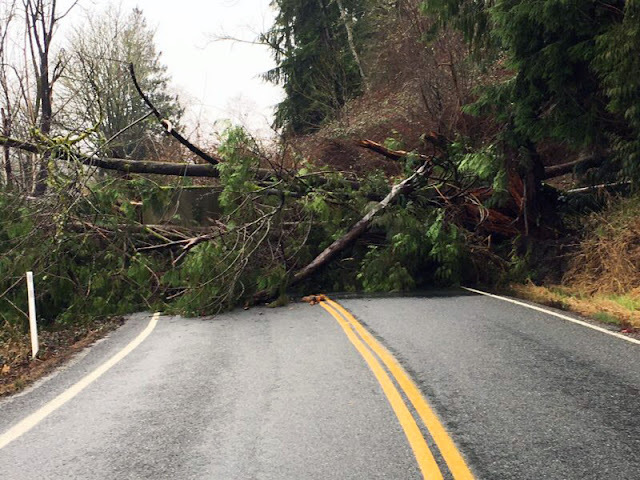 Being prepared is vital in staying safe during our Pacific Northwest storms. It’s been a frustrating week for some of our maintenance crews who work along I-90. No, we’re not talking about snow. There’s not much anyone can do about that. from the restroom wall, causing the area to flood. Both our Indian John and Ryegrass rest areas were hit with some significant vandalism this week. Not only does that pull our maintenance teams away from other work, it also pulls money from our maintenance budget that could go toward pothole repair or other important highway safety jobs. 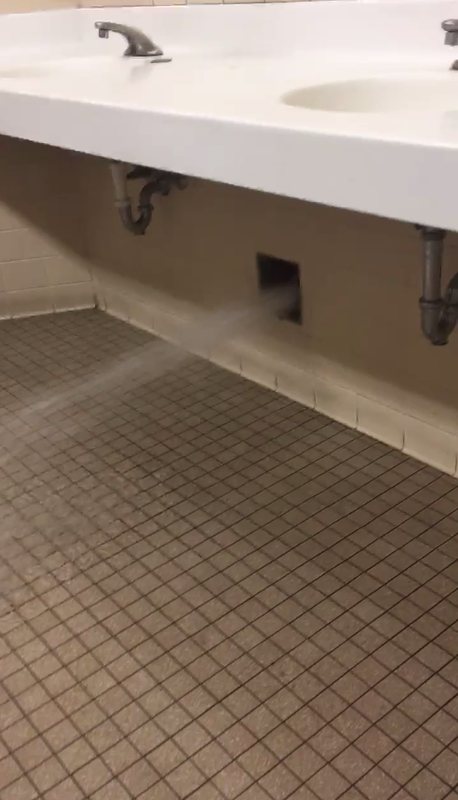 the Indian John Rest Area restroom. 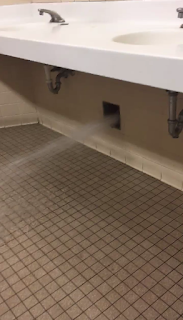 At our Indian John Rest Area, crews found that someone had pulled the plumbing out of a restroom wall, causing flooding in and around the building. 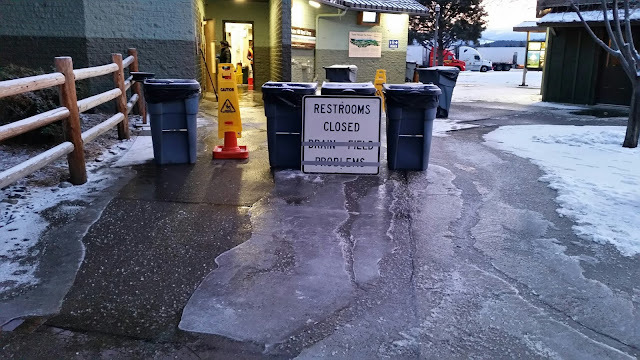 Cleanup and temporary repairs led to the rest stop, located east of Cle Elum, being closed for several hours. We’ll still need to return to do a permanent repair. 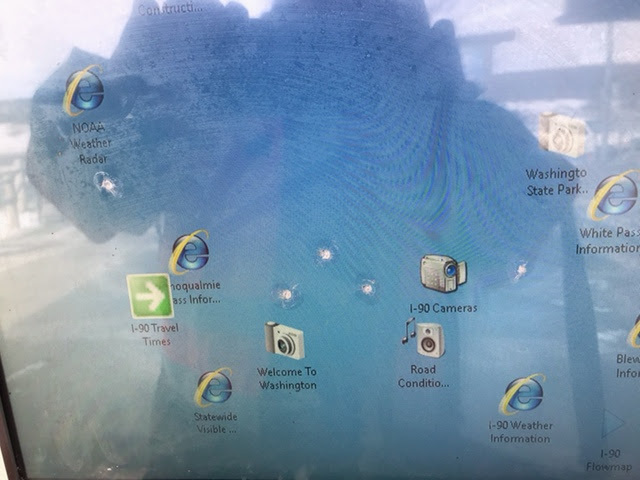 Meanwhile, at the westbound Ryegrass Rest Area, east of Ellensburg, someone decided to see how strong the touch screen monitor on our information kiosk was, smashing several divots in the screen with some kind of tool or instrument. 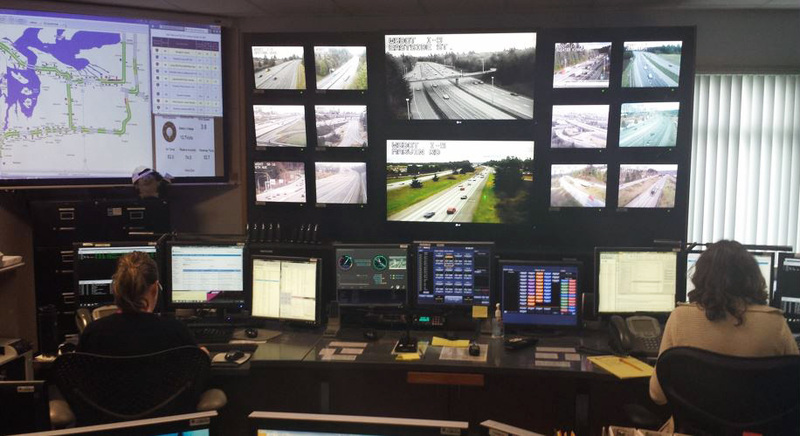 These monitors provide travelers with information like road conditions and location of amenities. The damage likely means the monitor will fail and we’ll have to replace it sooner than expected. Whether it’s graffiti, wire theft or situations like those we saw this week, there’s really no excuse for vandalism. In the past two years we spent $665,000 just on graffiti removal statewide, and this year we project that cost to be about $435,000. That’s not even counting the cost to make repairs to incidents like the ones we faced this week. While we have many cameras throughout our highway system, we don’t have them everywhere, and we don’t record video on them. Most of the vandalism also seems to take place at night, making it even harder to catch. But you can help. If you see vandalism occurring on state property, whether it’s graffiti, theft or damage to signs or rest areas, please call 911 to report it. 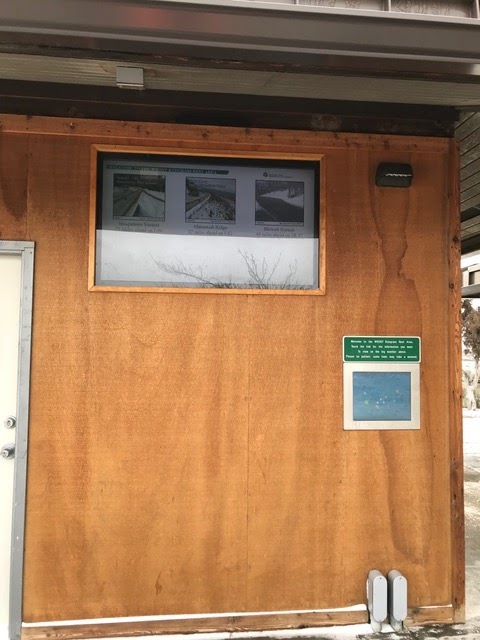 Vandals punched several holes in an informational kiosk monitor at our Ryegrass Rest Area. to travelers, was damaged when vandals punched holes in the monitor. Changes to how we react to wind on the I-90 Homer M. Hadley Floating Bridge could mean a temporary closure during high wind events. This bridge carries westbound I-90 traffic, the future Sound Transit light rail tracks and the I-90 Trail. If we hit a new threshold of sustained winds from the north of at least 40 mph for one minute, we will not allow traffic onto the westbound I-90 bridge between Mercer Island and Seattle. Emergency vehicles will have access to the bridge at all times. Wind and wave analyses performed during Sound Transit's East Link design process showed the pontoons on the westbound I-90 bridge are susceptible to damage during strong north wind events. It's important to note that there is no immediate safety risk to the public or the bridge. However, any damage caused by strong north winds can shorten the life of the bridge. 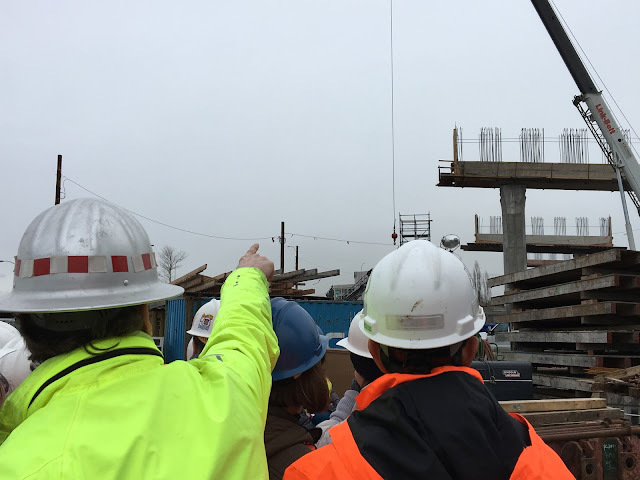 Our Bridge Preservation Office used the analysis from Sound Transit to determine the criteria in order to preserve the life of the westbound I-90 floating bridge. How much notice will travelers receive in the event of a westbound I-90 closure? We will give as much notice as possible about potential closures, however, we will not close the road until the wind criteria is met. Once that happens, we can close the roadway in about 15 minutes. We will use social media, our mobile app and overhead message signs to alert travelers. 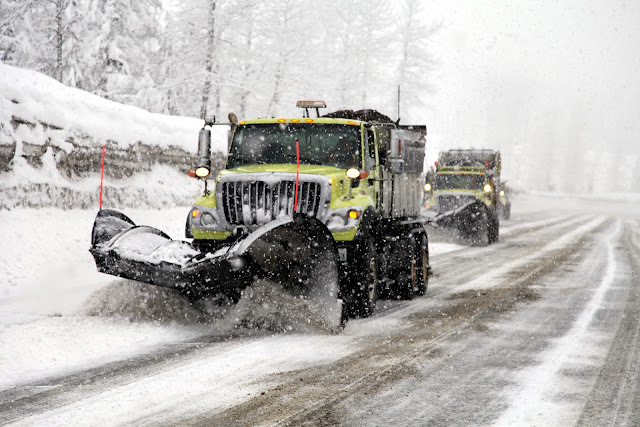 As is the case with any emergency closure, whether it's due to multiple spin outs on Snoqualmie Pass or a major collision, we all need to be prepared for delays whenever we hit the road. We will continue to do our best to keep you informed of any and all closures that could affect you. In the Seattle and Mercer Island areas, you can get real-time traffic information on your phone with the WSDOT traffic app, track the WSDOT Traffic Twitter feed and check out our Facebook page. I'm sure you're wondering how we got here and why the bridge hasn't closed in the past when we've had high winds. The westbound I-90 floating bridge was designed in the late 1970s and built in the 1980s and, like our hairstyles and clothes, many things have changed in the world of floating bridge engineering since then. If we were to build a brand new I-90 bridge today, it would likely look significantly different that the I-90 floating bridges you drive across today. It's not that today's bridge is unsafe or needs to be replaced but we've learned a lot over the past 40 years. We now have much higher 100-year- storm criteria and know more about local storm and wind patterns. We get it. Nobody likes a pass closure. You’re headed to see family, or taking kids to a sporting event or just trying to hit the slopes -- and a delay is the last thing you need. But, winter weather can be unpredictable, so it’s always better to be prepared before you head out. So, why do passes close? The short answer is because we want to keep everyone – travelers, our crews and law enforcement – safe. It’s our top priority and at times, that means delays or closures. Vehicle collisions/spin outs – Many pass closures are caused by vehicles that spin out, crash or slide off the roadway – often because the vehicle wasn’t properly equipped or the driver was going too fast for conditions. Slow down, stay alert and leave extra space between vehicles during winter conditions. Avalanche control - We monitor avalanche risk throughout the winter and at times shut down roadways to force an avalanche rather than risk unstable slopes giving way while drivers are on the roadway. We try to schedule these during non-peak hours, but Mother Nature doesn’t always cooperate. Road conditions/clearing – During heavy storms or extreme conditions, it may not be safe for our crews to be out clearing the roadway. Don’t be the person who shuts down the pass for everyone. Our crews work hard to pre-treat and clear roadways, but we need your help too. 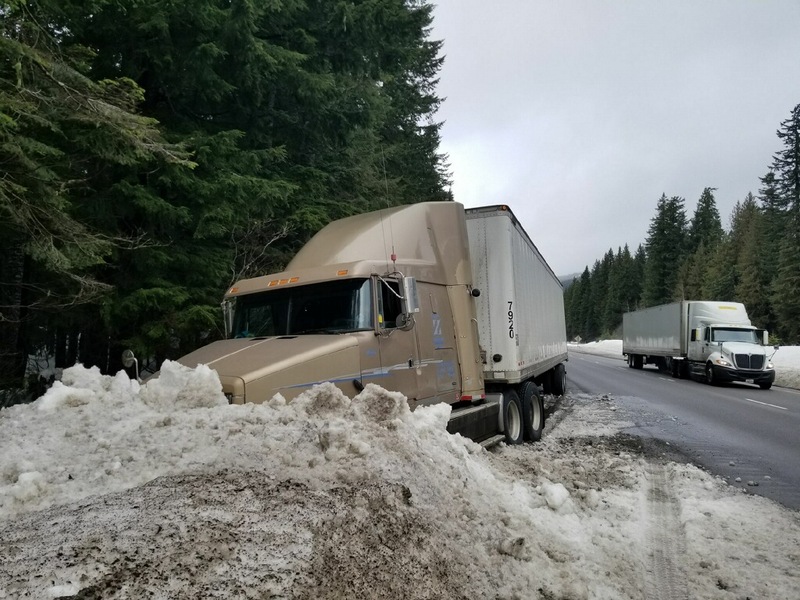 Roughly half the Snoqualmie Pass closures are due to spin outs or crashes, when we must close the road to bring tow trucks and other response vehicles to get someone out of a ditch – holding up everyone else traveling. Often these vehicles don’t have proper equipment or drivers were going too fast for conditions. Practice installing your chains at home, before you head out. This helps you be quicker and more prepared if you do need to install them on the side of a roadway. Don’t know how to install chains? Check out our online video. If you don’t have the proper equipment to travel during pass restrictions, then delay your trip or find alternate transportation. We want everyone to get where they’re going safely – and no trip is worth risking your safety as well as others on the road. You need more than just traction tires and chains during winter weather. While our crews work hard to keep roadways open, you need to be prepared for unexpected stops if roads need to be closed for clearing, avalanche work or unsafe conditions. Please be sure you pack your winter vehicle kit (pdf) to ensure you have enough food, water, warm clothes and other supplies if you’re delayed or need to stop unexpectedly. We have a variety of tools to keep you informed both before and during your travels. Use them early and often to stay up-to-date on conditions and any closures or delays. Check out online tools, including mobile apps, traffic cameras and email alerts*. Visit our online traveler information about traffic, weather and ferry schedules. *Never use your phone or mobile device while driving – it’s dangerous and against the law. Have a passenger check road updates or pull over into a safe area, like a rest area, before checking on your own. Again, we work hard to keep closures and delays to a minimum, but we still need travelers to be prepared and follow road restrictions when they’re posted. These two steps can help make everyone’s trips a little easier. Crews work around the clock to clear snow and ice – and bring on extra staff during large storms. Please help us keep the passes open by driving for conditions and following traction restrictions. Traction restrictions are put in place due to hazardous conditions – please obey all restrictions and drive prepared. 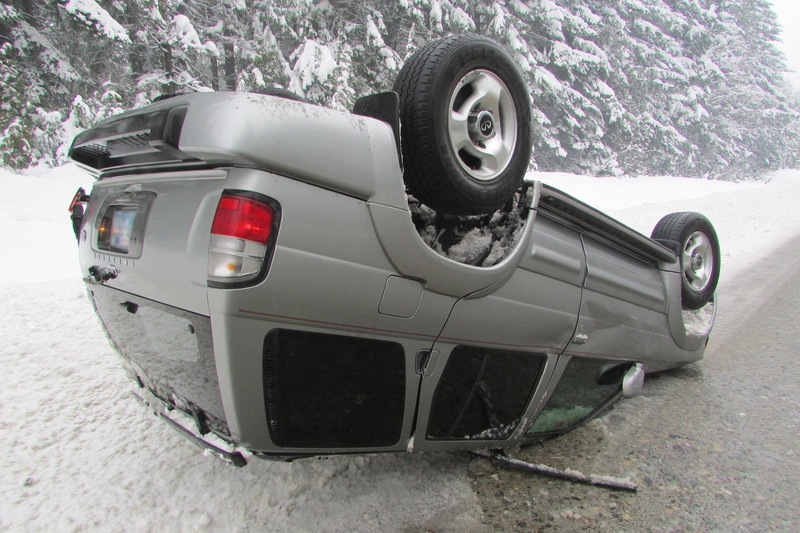 Slide offs and crashes are a regular cause of pass closures, as tow trucks need room to respond. A fish window sounds like a great way to watch our gilled friends cruise through the water, but it's actually something a bit more important, and marks a significant milestone on our Colman Dock replacement project in Seattle. You see, our crews can only do in-water construction work like pile-driving, from August to mid-February each year when migrating salmon are less likely to be around. Hence, the fish window. And that fish window closes on Feb. 15. The fish window only allows in-water construction, such as driving steel piles to support the new dock, between August 1 and mid-February. We use a high power bubble machine in the water to minimize noise from pile driving. That means that construction will still be happening on the project, but crews won't be driving support piles or doing any other work below the water line until August 1 when the window opens back up again. The good news is, we've made great progress toward building a new terminal! During the last six months workers successfully installed 167 steel piles to support the future passenger-only dock and one-third of the trestle that will support a new ferry terminal building – all while protecting the environment. 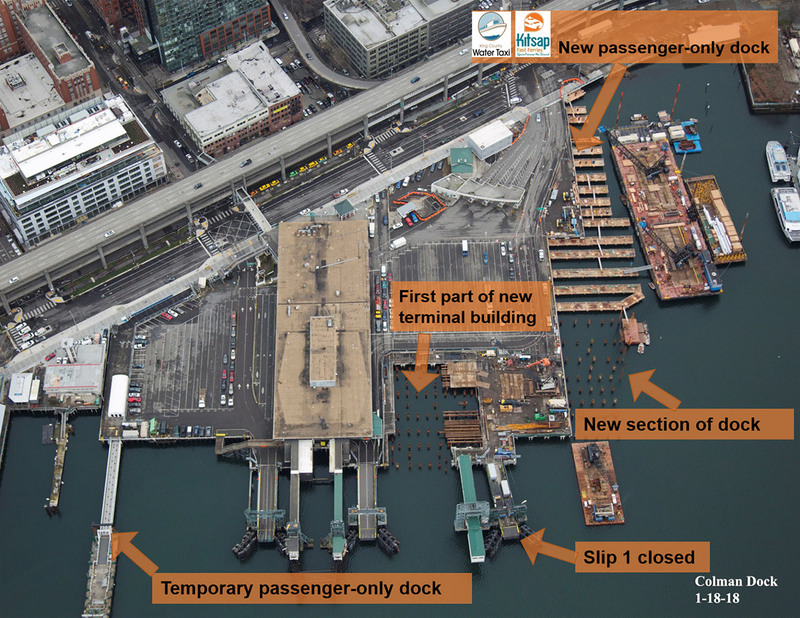 A total of 500 steel piles are needed to make the busiest ferry terminal in the state safer in a major earthquake. building, and the new King County Water Taxi and Kitsap Transit Fast Ferry location. 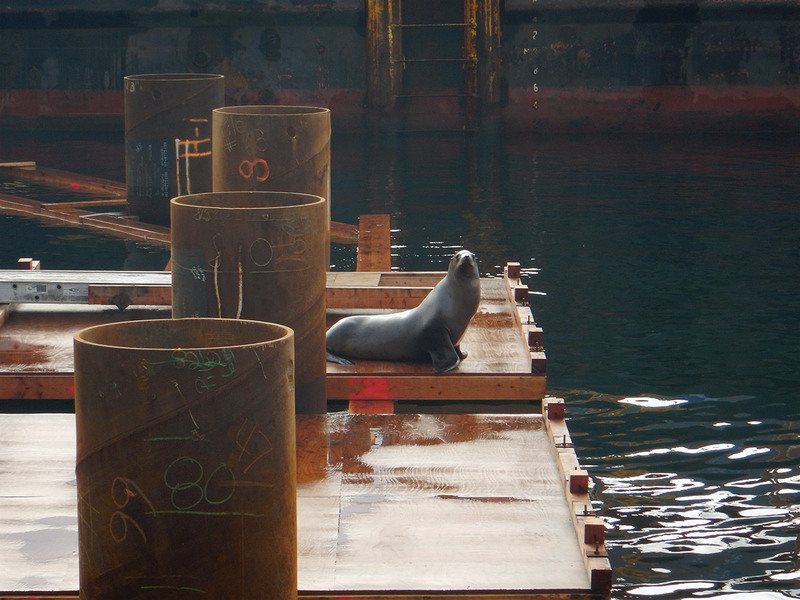 All in-water construction at Colman Dock temporarily stops when protected species, such as southern resident orcas or other marine mammals, are in sight. However, unlike our orca neighbors, migrating salmon can be tougher to detect beneath the surface of Elliott Bay. That's where the annual "fish window" comes in. Our biologists work with regulatory agencies to study salmon migration patterns and know when they are most likely to be in the area, and most likely not, and determine the window based on that information. What's the big deal? What could happen to the salmon? Good question. The impact hammer used to drive in the last 10-15 feet of each steel pile creates underwater shockwaves that could cause them harm. Though much quieter than pile driving, sediment capping is also done during the fish window, outside of the salmon migration period. Sediment capping carefully drops a layer of sand and gravel onto the bottom of the bay around the dock, to cap off hazardous materials that could threaten marine life. The impact of the sand and gravel hitting the bottom temporarily causes a hazy mix of sediment and saltwater, called turbidity, which could be difficult for fish to navigate. But once that settles down after a few minutes, fish and other species have a cleaner home. We want to make sure everyone, from workers to wildlife, stay safe during the project. to marine mammals search for food and navigating through Puget Sound. Just because in-water work will pause doesn’t mean work will stop. Construction to rebuild the state’s largest ferry terminal is like a game of Tetris, fitting in work where it makes sense from the bottom up. Now that the fish window is closed, construction activity shifts to build the new terminal and passenger-only dock atop the steel pile foundation. Starting in early March, crews will tear down sections of the existing terminal building. Customers can expect full ferry service throughout construction, with no reduction in the number of sailings. However, there will be fewer amenities and public space while the terminal building is under construction through mid-2019. Exterior demolition of the existing terminal building begins in late spring 2018, clearing the way to install new steel support piles on the north side of the dock once the next fish window opens this August. Roadwork and construction are so common that they can feel like a part of our everyday life. We see caution signs and commute through work zones, notice pavement going down and bridges coming up out of the ground. For example, if you drive on Interstate 405 near the State Route 167 interchange in Renton, you have probably seen the progress our crews have been making on the I-405/SR 167 Interchange Direct Connector Project this past year. With all of our construction projects, we place a heavy emphasis on safety. It’s our top priority to get our crews and public home safely, and we’re always reminding drivers to give our crews a brake. Many hazards exist on any construction site, especially complex roadway projects. Falls, extreme weather, and working near heavy equipment, in confined spaces such as trenches and near fast-moving traffic, often at night, are just some of the risks that our crews face. But safety standards and practices can vary widely around the world. That’s why the University of Washington Department of Environmental and Occupational Health Sciences recently hosted a weeklong seminar on roadway construction safety for the Federation of Mongolian Road Workers. This group is composed of trade union leaders, electrical engineers, educators/safety trainers, labor economists, social insurance professionals, and other consultants. A few Mongolian roadway construction company owners also attended. The UW approached us to provide our perspectives and best practices through the lens of an active construction project. 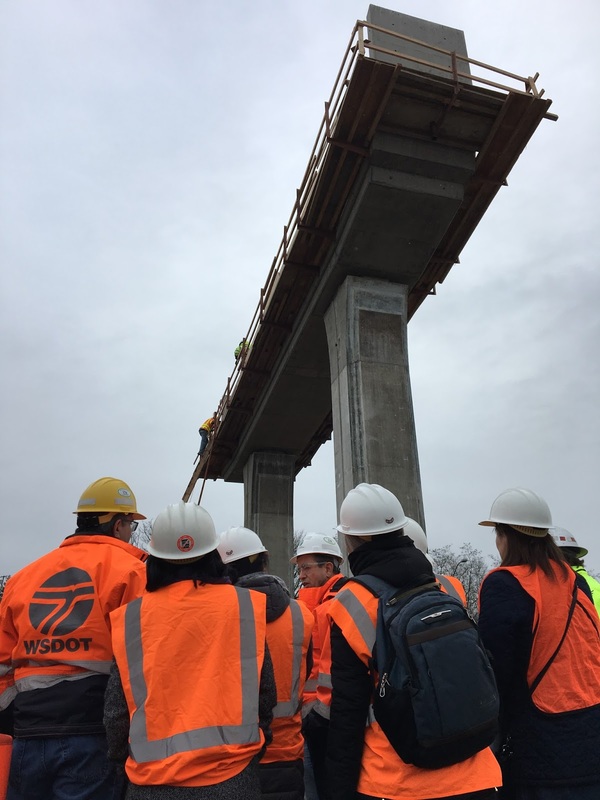 On one of those days, our Direct Connector project team had the opportunity to share our culture of safety with the group and tour key work zones near the busy interchange in Renton. In the 21 provinces of Mongolia, there are about 30,000 miles of roads – compared to 4.12 million miles of road in the United States – and about 25 percent are paved. Currently there are no highways in Mongolia, only single-lane roads, but that is about to change. With a new roadway construction push scheduled in the coming year, the Mongolian Labor Union Association has made health and safety a major goal and priority. 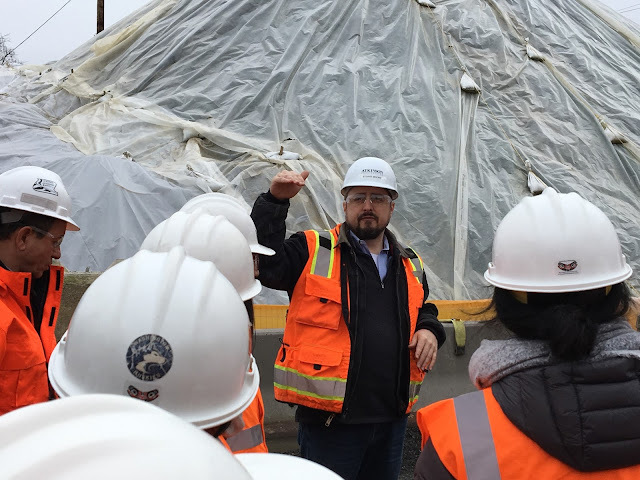 During the tour, we showed them several examples of the emphasis placed on safety for our workers and the measures our project team takes to protect the environment. We also gave them information about hazard analysis and mitigation, on-site safety, and the importance of personal protective equipment. The Direct Connector construction team is proud of our culture of safety and we thoroughly enjoyed the opportunity to exchange ideas with the group. While you are wooing your sweetheart with chocolate and flowers on Valentine’s Day, our crews will be providing some TLC to our highways to help you make it safely to your loved ones. And while candy and stuffed animals are nice, you can really show your love to our road crews by being safe on the highways. There’s no better gift you can give them than sending them home safely to their families. When we pass by a work zone we see flaggers, construction workers, Incident Response Team members, and they often don’t look like much more than an orange vest and hard hat. But the reality is our road workers are husbands, fathers, brothers, wives, mothers, sisters, children and friends – and they all deserve to go home safe at the end of their shift. And not just when they might have a romantic Valentine’s dinner planned, but every day. 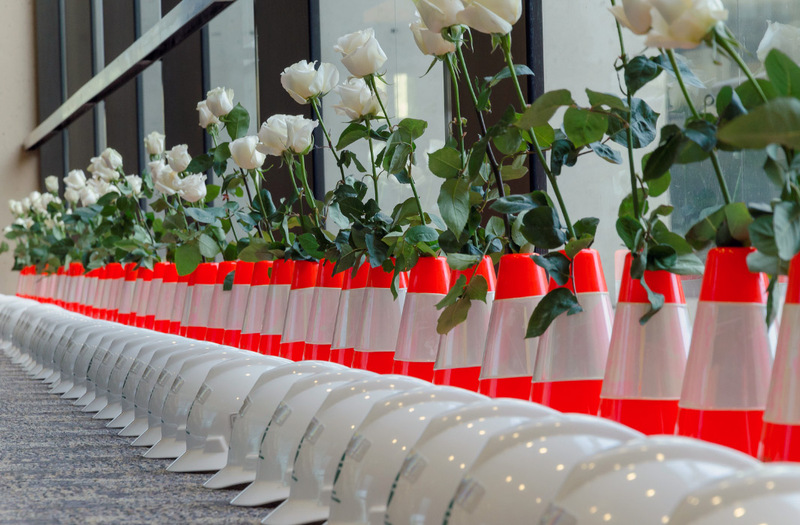 Safety is our top priority for everyone, but unfortunately every year we see work zone collisions that injure our workers – sometimes with life-altering injuries. Since 1950, 60 of our employees have been killed on the job. They leave behind families, friends, and co-workers whose lives are never the same. Left: Crews doing night work are particularly vulnerable so please be sure to slow down and give them space. Get home to your loved ones safely, too! It’s not just our workers who are in danger in work zone crashes. In fact, drivers are more likely to be hurt in a work zone collision. On average, 96 percent of people hurt in work zone collisions on our state highways are motorists, their passengers or passing pedestrians. Driver inattention, following too closely, and excessive speed are the primary causes and can be easily avoided. Text your partner an “XOXO” once you have safely parked. Don’t come on too strong, give that vehicle in front of you some personal space. Plan ahead so you don’t have to speed to your candlelight date, and save on those traffic fines that are doubled in work zones. We know that you would rather spend that money on roses or a heart-shaped box of chocolates for the person you love than pay a hefty ticket. Since 1950, 60 of our workers have been killed on the job. Please help keep them safe. Slow down near work zones. Be kind – work zones and delays are to improve roads and getting frustrated can lead to distractions. Pay attention. Focus on the road and watch for both workers directing you as well as surrounding traffic. Give road workers plenty of space to do their job. Our road workers will tell you they love nothing more than being able to return home to their Valentine. Help give them that gift by being focused and alert around road crews as you would be around your own sweetheart on Valentine’s Day. It's not just 60 mph traffic on the interstates that put our maintenance crews at risk - it's everything from falling trees to inattentive drivers to avalanches and this week, it was the rain. State Route 9 between Mt. 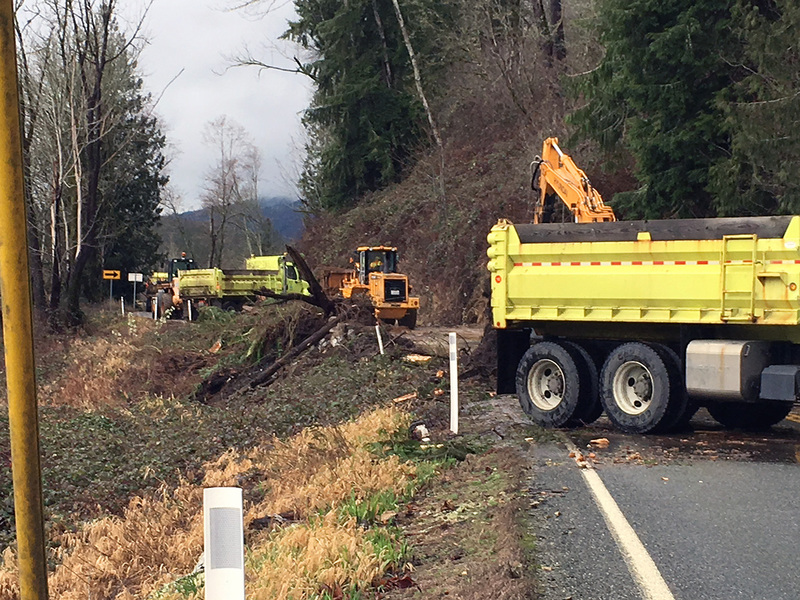 Vernon and Arlington reopened Thursday evening following four days of a 24/7 closure as rain saturated hillsides, fields and roadways around northwest Washington. above SR 9 near Mt. Vernon slide across the highway. On Sunday, Feb. 4 while many of us were enjoying the Super Bowl, crews from our Mt. Vernon maintenance shop were putting up signs where water was covering roads and cleaning out culverts, including one along SR 9 south of Lake McMurray. They'd cleaned out what debris they could but the amount of water coming down was too much for the culvert and was washing over the road. The crews left to get warning signs but when they returned they found a landslide full of mud, trees and a huge concrete chunk of old dairy equipment from high on the hillside blocking both lanes of the highway. the slide that covered SR 9 when a slide happened on Sunday, Feb. 4. We closed the road overnight until our geotechnical engineers could safely assess the stability of the slope. Once on the scene our geotechs didn't detect any movement in the slope so our crews spent Monday afternoon and all day Tuesday clearing out trees, mud and breaking up that concrete structure to haul away while dealing with continued rainfall. They were nearly done and ready to reopen the road on Tuesday afternoon when another slide came down onto the road. It brought enough debris that it came up to the top track of our excavator – about three feet off the ground - that was on the road clearing a section of culvert. This created another safety hazard and our crews got out of the area. A geotech returned to the scene on Wednesday and found that instead of absorbing the continued rain, the hillside was quickly pushing it out. Our crews realized they needed to do something to help move that water out of the area to get the road back open. 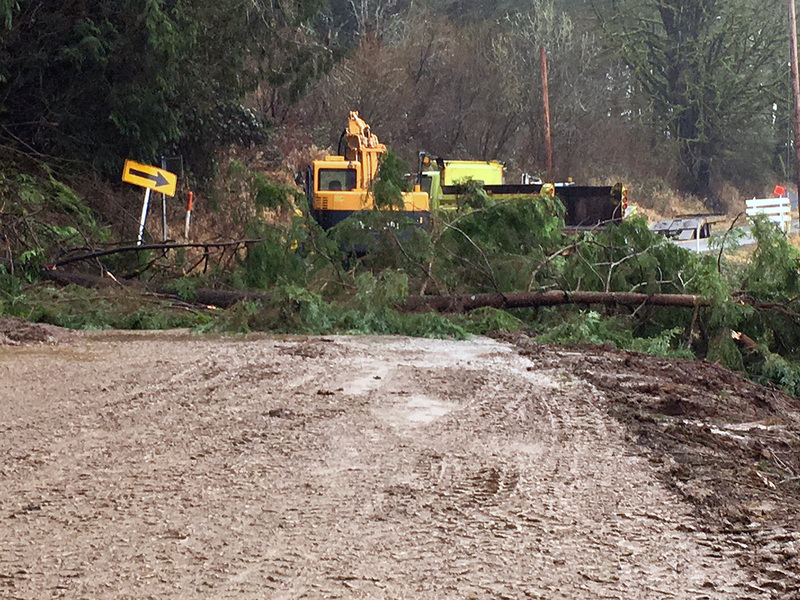 As soon as they safely could, our maintenance crews started work to cut, break up and clear the debris across SR 9. The geotech approved work to resume on Thursday so we got to work cutting trees that had lost their secure base in the slide, removing mud and rocks from the road and installing new drainage to help move that water. The final step was getting the dirt and muck covering the road lifted off to make lane striping visible, which our sweeper truck handled faster than expected and the road reopened at about 5 p.m. Preventing slides during heavy rainfall is a challenge and can't always be avoided, though we try. We monitor areas where slides are common and our maintenance teams regularly look for changes in a landscape which may indicate movement, including trees or rocks which may have shifted. If anything out of the ordinary is noticed, we call in geotechs to evaluate, which may lead to us removing hazards, adding bolts to hold rocks in place or building catch basins or barriers. But sometimes, weather simply wins out. 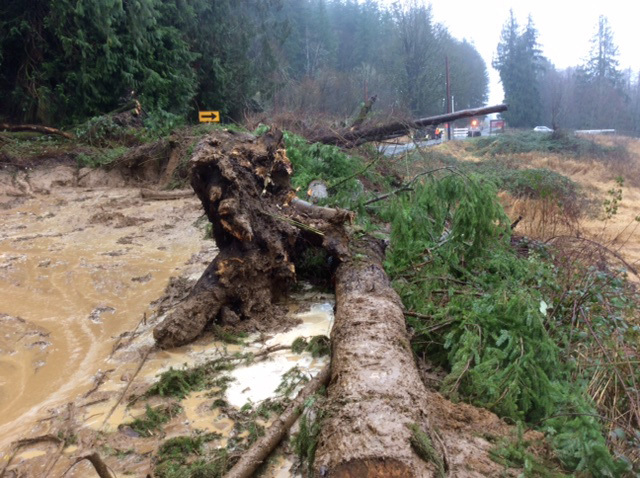 when another slide knocked down trees and more mud across SR 9. You can help too. If you see anything that looks unusual, please call 911 so that they can alert the right agency to go have a look. We try to see everything on our highways but we can't be everywhere, and any help you can provide is appreciated. The closure of SR 9 was tough, both for those of you who typically use the highway, and for our crews working to get it back open. A big thanks to all of you for your patience, and a huge kudos to our crews who battled some very tough elements and sometimes dangerous conditions to get the slide cleared. Call it a clog, a slow-down, a standstill or some other colorful phrase, merging onto I-5 from Mercer Street in Seattle can be a trying experience, with backups extending beyond the length of the on-ramp to I-5. Also exasperating- the I-5 drive through Seattle as the onslaught of slow-merging vehicles brings freeway traffic to a halt. Beginning Saturday, March 10, the merge will look a little different. 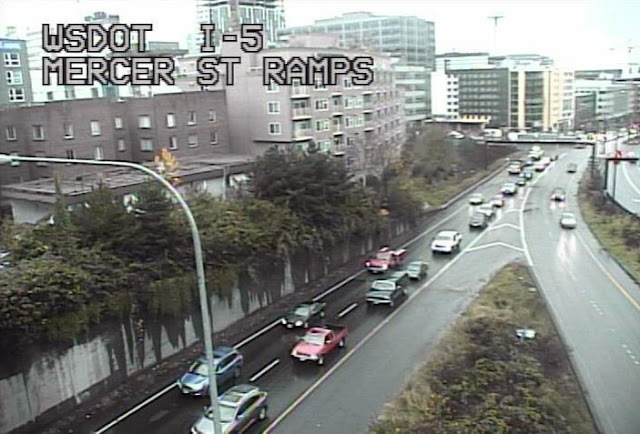 New signals installed on the ramps from Mercer Street to both northbound and southbound I-5 will help to pace the merging vehicles. For the first month, the signals will meter traffic during the weekends. After a month of monitoring and evaluating the metered traffic, our engineers will turn on the signals during the week as well. Weekday metering will start Tuesday, April 17. On Mercer Street, once you cross Fairview Avenue, you will have two lanes on the ramp to northbound I-5 and three lanes on the ramp to southbound I-5 where you can wait for your green light to merge onto the freeway. The signals will alternate traffic from each lane, and instead of a clogged ramp, picture more of a slow leak of vehicles onto I-5. Gaps between merging vehicles will make the merge easier and reduce the risk of collisions near the I-5 on-ramps. Traffic engineers will monitor congestion and travel times on I-5 to determine when to turn on ramp metering. In coordination with the Seattle Department of Transportation, they will also monitor and adjust the ramp metering when it is active. As far as backups and delays on Mercer Street itself, engineers do not expect any negative effect. For more information about ramp meters, check out our ramp meter webpage. We are confident the new meters at this major downtown intersection will help move traffic out of the city safely and with more consistency.